For those of us who can’t get enough, there have been lots of Strawberry biggys over the years. At 4x the normal size, these jumbo smackers should sustain your addiction for awhile. Check out how cool the vintage Strawberry Lip Smacker looked in the 70’s and 80’s! I am still holding out hope that BB will bring back the rope necklaces someday. lipsmackers rock! i’ve been wearing them for years and i more than likely will still be using them even when i’m 80! they are super cheap, moisturizing and come in a ton of fun flavors and scents. i remember all the awesome flavors that they had in the 80’s (and early 90’s) like root beer float, cinnamon and sugar, gooey fruits, chocolate milk, starfruit, pink chocolate, jelly bean, sugar plum, coconut cake (not the one they have now but a completely different one) ect. it seemed like they stopped making yummy new flavors and just had the basic ones but recently, theyv’e started making awesome flavors again. at any rate, no matter what flavor-i absolutely love lip smackers! i also collect vintage cosmetics and have a ton of old school 70’s and 80’s lipglosses- village lip lickers, kissing potions, kissing koolers and would LOVE to have a vintage lip smacker to go in my collection but it seems like noone has any. and if they do, they sure don’t wanna sell them because i’ve NEVER seen 1 on ebay or anywhere else! they ones in the pic look way cool! i knew they were big and you could wear them around your neck on a string. i’m not gonna stop looking for one of the vintage ones but until then, i’m more than happy with the chapstick-sized ones! I agree, they’re the best lip balm hands down. 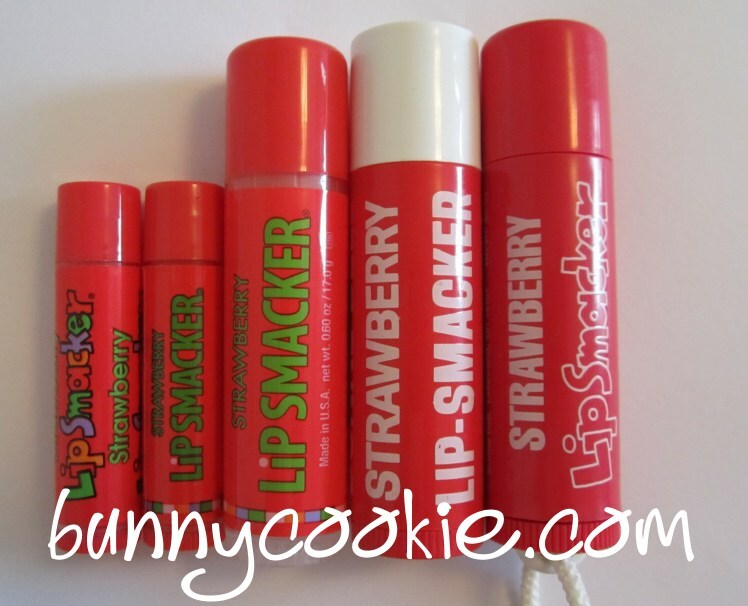 80’s/90’s Lip Smackers were my favorite too; their flavors have been pretty tame this decade. I think Bonne Bell are realizing the demand is there and we’re starting to see some weirder stuff again. Village Lip Lickers always seemed really cool to me from what I’ve seen online, and has a pretty dedicated fanbase. I haven’t seen them in person, unfortunately. you wouldn’t wanna sell one of your vintage ones, would you? i would pay you accordingly. oh man, that would be so cool! like i said, i’ll pay you a good amount for it just because they are so rare. let me know! Also yes, nearly all of my vintage smackers still have the original color and smell!